"It is difficult for us in Europe to get a clear picture of what is going on in America in the field of art photography. For that reason one should judge with leniency what we are here saying about the characteristic features of the American photographs that have been compiled for this book by Alfred Stieglitz. In this country R. Eickemeyer has been known the longest. He is a representative of the old school, as opposed to the new one to which Stieglitz belongs. C. J. Berg (New York), Miss Farnsworth (Albany), E. Lee Ferguson (Washington), Miss Zaida Ben Yusuf (New York) and F. Holland Day (Boston) could be considered as one group. Their taste in photography is "of a feminine kind, almost leaning towards a certain mellowness and occasionally bordering on sweetness." F. Holland Day, however, is an exception, even though he also places the naked or semi-naked human body in the centre. "The sharpness and greatness of his perception is sometimes reminiscent of the Pre-Raphaelites". Alfred Stieglitz belongs unconditionally to the modern movement. Today he is probably at the top of everything that has to do with photography in America, and he is an artist in portraiture as well as in landscape photography. Even if someone's initial reaction when looking at his pictures might be: "like Liebermann', he is certainly more than just a skilled copyist. However, future developments are not likely to begin with Stieglitz. There is still no one who will achieve what is lacking today: an American school of photography." 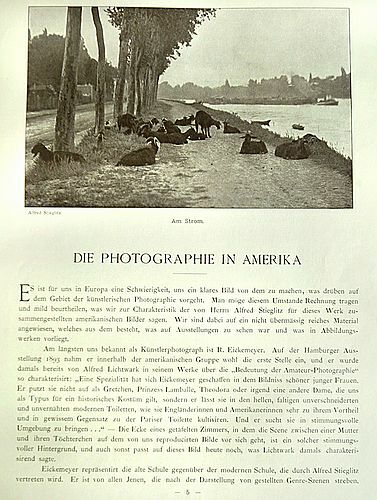 The photograph was taken in 1894 by Alfred Stieglitz and is also known as: "Decorative Panel" or "On the Seine-Near Paris" or "Goats Along the Seine".